Among the major aims of Leaders Media Ltd. belongs the achieving the highest level of quality of customers services. We focus on the continuous improvement of the activities of our organization and we consistently work on the achieving of our aims in field of the quality of products and services and performance of international quality standards. The result of our efforts is the the recognition of the quality of provided services not only at the online stores operated by Media Leaders Ltd. between customers and the obtaining of the internationally recognized certificate of quality. The satisfaction of our customers and all stakeholders is basic assumption for our long-term success. EN ISO 9001:2008 specifies requirements for a management system of quality, when an organization needs to demonstrate its ability to consistently provide products that perform demands of customers and focuses on increasing of satisfaction of customers through the effective application of the system, including processes to achieve continuous improvement of this system. All requirements of this International standard are generally applicable to any organization, regardless of its type, size and kind of products they provide. 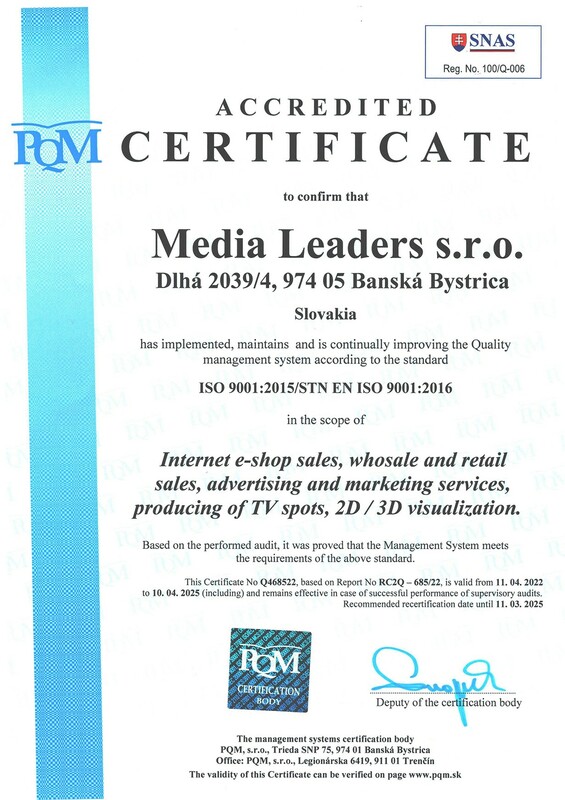 The certificate confirms that the quality system of Leaders Media Ltd. is consistent with the requirements of the system of quality EN ISO 9001:2008.